Before I begin the newsletter, let me thank you for participating in the survey of what you want in upcoming topics. It's a free survey with limited features, so I only get to see the first 100 responses and we reached that pretty fast. View the results here if you're interested. If you missed voting and want to add your comments, visit the survey results post comment section. We began praying about Sandy's weather a few days before it was to be in Virginia and some of you have told me you were praying for us also. Thank you so much! It seems to have missed our niche here in Central Virginia. We had a slow steady rain that was great for the tree transplants that Randal did, and the highest wind was about 10 mph. What a huge blessing considering all of the damage in so many areas of the East Coast. I've already had some friends wondering why God does things like that. God isn't necessarily the creator of bad weather. Luke 8:24 gives us a bit more insight on weather. Randal has a Poke Weed plant outside of his office window (photo link is 2009) and it's grown rather huge now and spreads out to cover the width of the double window. It's not a dense plant so you can see through it. The fun begins towards the end of August when the poke berries begin to ripen. This continues into frost. A couple weeks ago Randal was in the office and saw a bird hit the window and berry juice splattered from its mouth. It didn't look like a good news story, but it turned out well. He went to the window and looked down to see the bird on its back not able to get itself turned about. He went out and sat it up in a protected area beneath the window and told me so I could photograph it to know what it was. I went outside and took some zoom shots from afar and then moved in a little more since it seemed to have its eyes closed. There didn't seem to be a broken wing or anything, so I moved in closer for better photos and kept praying it would be okay. 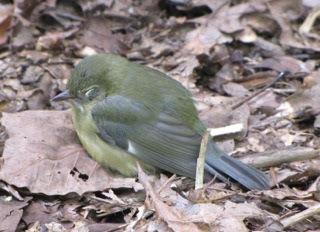 I could tell it was a warbler so I went to my field guide and compared with the photos and found it to be a female Black-throated Blue Warbler. Are you looking at the photo and wondering where did that name come from? Me too! See the contrast between the male and female and realize that the bird was named for the male side of the species. View Male Black-throated Blue Warbler. This "letterbox" was visible once you found the location. What a contrast between male and female! She remained in shock for almost an hour and I was beginning to think we'd need to take her to the wildlife rehab center, but she came to her senses and flew off. We were so happy to have a good ending to the event. When I went to record the sighting of a female in our habitat on October 9th, I realized that the male had visited six (6) years before on the exact same day. Isn't that amazing! 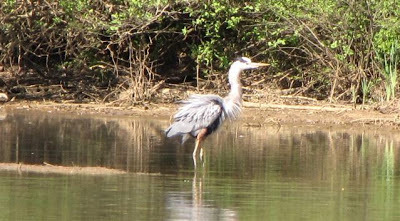 This species is not a permanent resident, but passes through during migration. 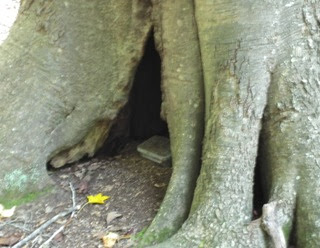 I mentioned in the last newsletter that we had done some letterboxing in Williamsburg, Virginia, at Waller Mill Park. The park was a really cool place with paddleboat, canoe and kayak rentals. Since we arrived early morning, it was a bit too chilly to think about being out on the lake and we had come to letterbox so we wanted to get on the Bayberry Trail where several boxes were hidden. The trail had many views of the water along the way, so it was really nice, but there were so many tree roots in the path that you really had to watch where your feet were going to keep from tripping. The photo album for Waller Mill Park in Williamsburg, Virginia, is now on the gallery website. It's such fun to visit places, take lots of pictures and then revisit it again as I go through to edit, delete and look up information about the places. I learn so much more after I'm home than I did while I was there. View photo album of Waller Mill Park. Photography has been a really important part of my life since I got my first camera at age 10. When I switched to digital about 10 years ago, it added a whole new dimension of being able to take several shots and not think about the cost of film and the chemicals to develop it, besides the storage space being used for all my print photos. Now I'm in the process of scanning in all of those print photos, but I doubt I'll ever let go of the prints. There's something wonderful about holding a photo box in your lap and holding pictures of past memories and good times. Especially when those pictures have people in them that are no longer residing on the earth. We've set up the front porch bird buffet. This time we have everything hanging instead of having plates on the table. It's easier to clean up and they have the length of the porch to enjoy it all. I'll have pictures in my next newsletter. I'm not quite finished with the "final look." The birds don't care what it looks like ... they're already making it Grand Central Station. It's incredible the number of birds already visiting. We are using suet, dried mealworms, thistle, and safflowers so the squirrels have no interest. They would love the suet but it's hanging high where they can't get to it. 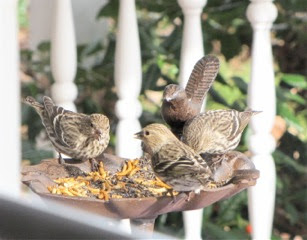 All of the feeders are, but if I had black oil sunflower seeds in them, they'd be all over the porch picking up the droppings and I like to see the White-throated Sparrows, Cardinals, and Tufted Titmouse getting them. The squirrels have their spread in the backyard. We celebrated my husband's birthday on October 23rd. He is four years younger than me at 58. One of the things he wanted was to get some cookies he had over a year ago from the Kroger bakery. Junk food on a regular basis is not our dietary preference, but on birthdays we seem to revert back a bit to our childhood years which were definitely full of junk food. As I was scanning the receipt on the way to the car, I noticed there was a senior discount on it. Funny, nobody asks any more ... I guess that means we look like seniors, eh? Hmmm .... well I am still claiming my promise of walking in divine health, so with that I may end up looking a lot younger. 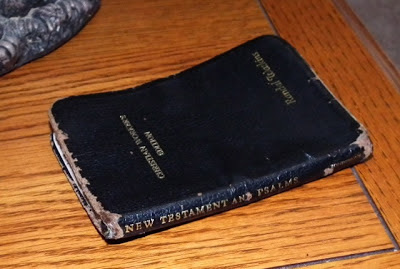 One of Randal's spiritual gifts is teaching and he loves to study the Word of God any time he has a few minutes waiting here and there, so he has been carrying a pocket-sized New Testament & Psalms in his back pocket for a long while. I gave it to him for Christmas 1981. As you can see from the photo, it's a bit ragged. 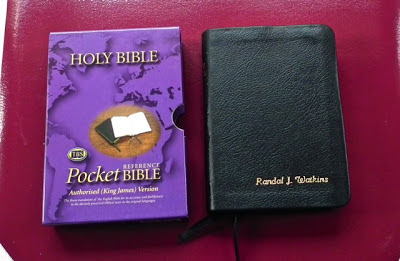 Lately he's been wanting to have the whole Bible in his back pocket, so his birthday request from our son was for a new pocket Bible. It's twice as thick as the other with print smaller than phonebook print. But one of Randal's healing journeys is for his eyes since he's been wearing "pop bottle glasses" since grade school. So he's able to read the font size of 6 just fine. Amazing! I told you in the last issue that I had just had a short haircut and the botanical perm that I do every nine months. 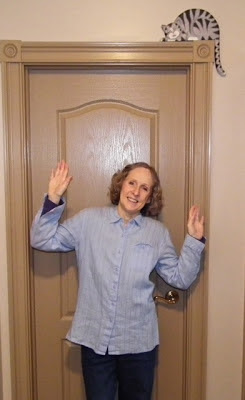 I always feel like Shirley Temple when I first get it or maybe Orphan Annie ... hear me singing the song from the movie? "The sun'll come out tomorrow. Tomorrow! Bet your bottom dollar that tomorrow there'll be sun! Just thinkin' about tomorrow clears away the cobwebs and the sorrow 'til there's none! When I'm stuck a day that's gray, and lonely, I just stick out my chin and grin, and say, The sun'll come out tomorrow, so ya gotta hang on 'til tomorrow, come what may. Tomorrow! Tomorrow! I love ya, tomorrow! You're always a day a way!" I've actually been singing that since we've had some gray dreary days, but there's always tomorrow for the sunshine to return. We can't live in the tomorrows, but must focus on today's blessings! It's the only thing that will keep us afloat some days. You can get really good at counting blessings when you give it a try for a period of time. It does change your joy level! Thank you for your encouraging emails! You are a treasure to my spirit and healing balm to my soul.